Home › News › It’s a small world! A completely chance encounter took place in 2013 in the Hansom Cab, York, (as was) between myself, my partner Peter, and a really nice couple from Wath-Upon-Dearne, which resulted in the reunion of my uncle, Les Cayton and his old boat the Highlander. The pub had been very full and having squeezed in beside Stuart Prigmore and Sheila Clarke, we struck up a conversation with them. They explained that they travel up to York each year in their boat and like to moor up for several weeks at a time. She is a real wooden boat they said, an ex-Whitby lifeboat called Highlander, and I was amazed. I told them that she had been my uncle Les Cayton’s boat for quite some time, back in the 50’s to 70’s and I remembered her well. 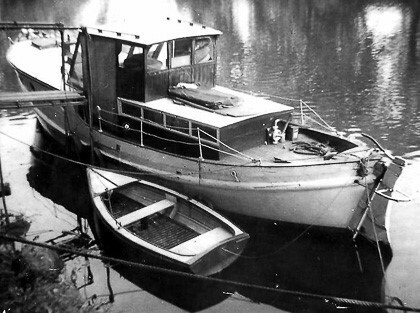 The Highlander in 1959, a few years after Les rescued her. Stuart and Sheila have owned her for the last 22 years, and since purchasing her from the Wakefield sea cadets she has been a real labour of love. 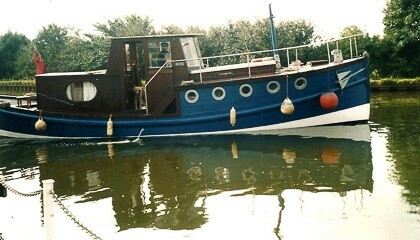 Fortunately Stuart is a carpenter by trade, so has been able to use his skills to repair, refit, modify and keep her going. Sheila had also delved into Highlander’s history so of course they were both keen to meet up with Les to fill in some of the gaps. We quickly organised a get together at their mooring alongside the Museum Gardens so they could all compare notes and Les could see his old boat once again. Les explained to them how the Highlander had actually been under water, close to Bishopthorpe Palace, when he discovered and bought her. Fortunately, he said, this had not been too much of a problem as his brother Eric Cayton was a fireman at the time and he and his colleagues from the York fire station had hoisted her up via chains in the trees and hosed her out as “an exercise”. 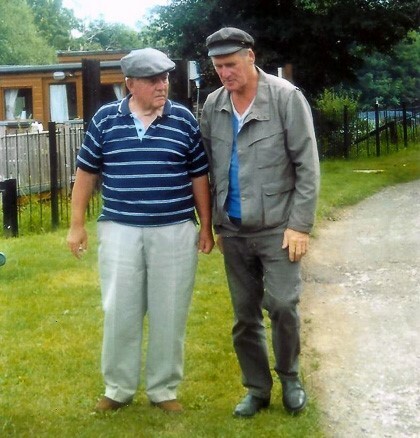 The two skippers: Les Cayton (left) and Stuart Prigmore meet up by the river. There followed a second meeting in Bishopthorpe so Les could show Stuart and Sheila where Highlander had lain submerged and subsequently been moored down Ferry Lane whilst she was in his possession. They told Les how happy and grateful they were that he had rescued Highlander all those years ago so that they in turn have had the opportunity to own and enjoy her themselves. Stuart and Sheila continue to keep in touch, feel a part of our family now and even refer to Les as “Uncle Les”. We now know that Highlander was built in 1908 and began her lifeboat service in Whitby as the second Robert & Mary Ellis. She was a 10 oared “self-righter” and saved 11 lives up until 1934 (weighing in at over 3 ton that can’t have been easy). At this point she was sold out of service to Captain Milburn who converted her into a houseboat and renamed her Highlander. So she is even older than Les (92), has been through two world wars and is still touching lives. Les back at the wheel of the Highlander. Photographs copyright Lesley Bradley.